I am the kind of person who will get obsessed with random things for a month or so and then I’ll forget about it as soon as I find something else I adore. I guess it’s the novelty of new or forgotten old things. From body sprays to watches and food. We all have this one favourite type, brand, style, etc. So here are some of the things I’ve been loving recently. Let’s start off with my all time favourite item. 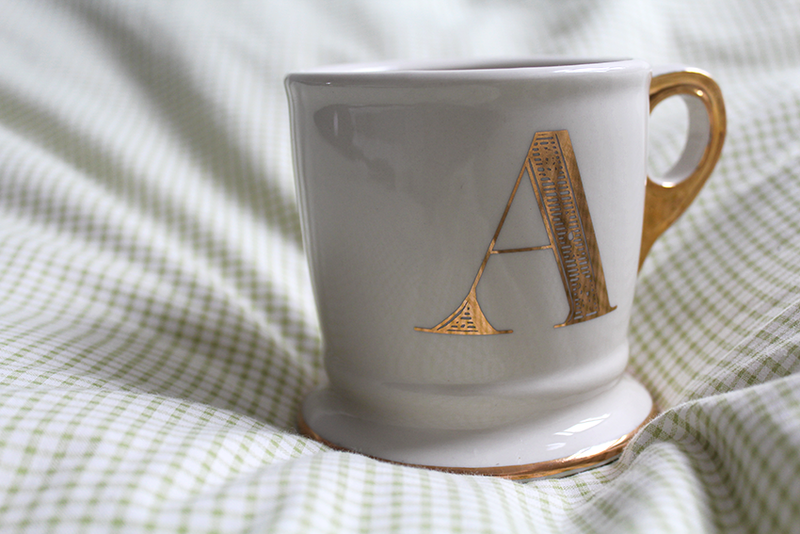 Everyone knows the classic black and white Anthropolgie mug with the different letters. I had been wanting it ever since I laid my eyes on it. When I walked into the store in December and saw the golden version of it I almost squeaked and obviously had to get it. I've been seeing it everywhere since it came out, countless bloggers and instagrammers have it and no wonder why. It’s so stunning and makes me feel classy. The only downside is that it’s not microwavable which is a bit annoying. Next thing is something I never thought I would have, let alone love it so much. It’s a Daniel Wellington watch. I had heard of the brand and had seen many people raving about it. When I heard the name Daniel Wellington, I immediately thought of their famous pink and blue watch (which I very much dislike) which is why I was pleasantly surprised when I got this one for Christmas. I love how simple and minimalistic it looks. 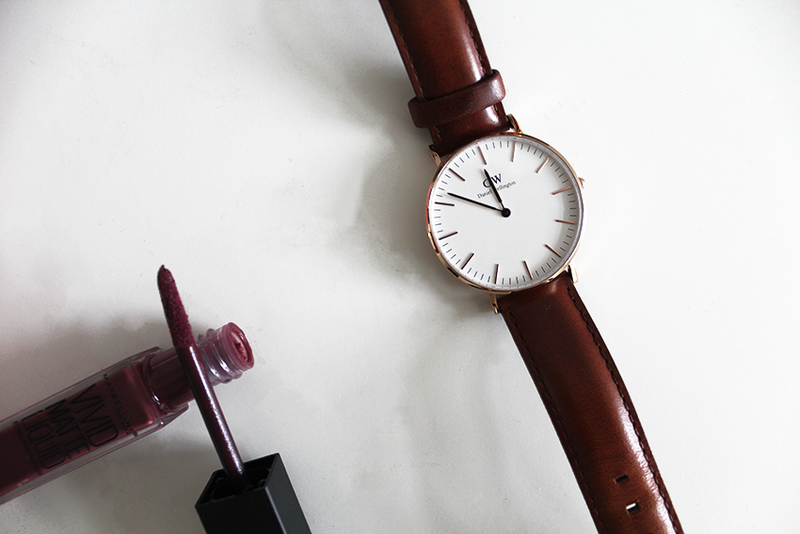 My favourite bit is the rose gold detailing, and it looks so beautiful with the brown leather strap! 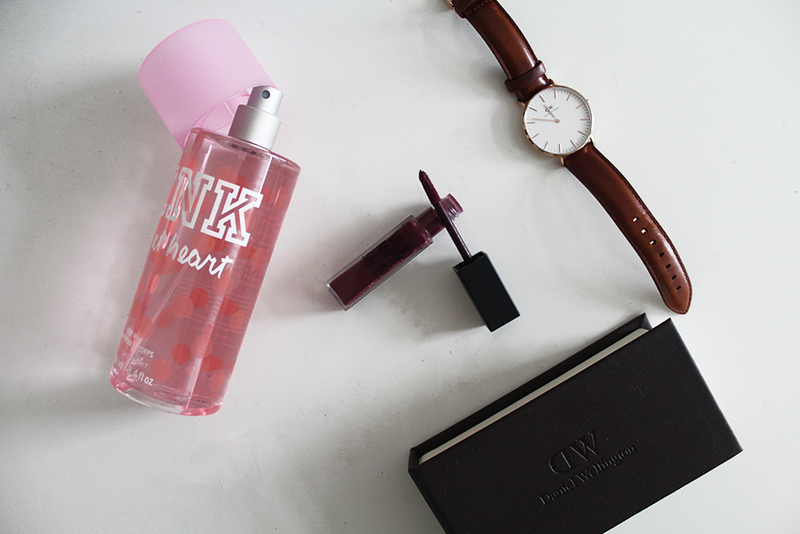 Something else I have been loving is VS Pink’s Wild At Heart body mist. I much prefer body sprays to perfumes for an every day use. Not only because they are lighter but because they are also more affordable. This one is a ‘refreshing body mist with red passion fruit and sheer musk’ - all I can say is that it smells very sweet and fresh so if you’re into this kind of scents you will love it! Finally, my last favourite is something I first didn’t quite like. It’s Maybelline’s Vivid Matte Liquid in Possessed Plum. I say that I didn’t like it when I first bought it because it’s not really matte. Maybe my expectations were too high, but I was expecting a similar look to Kylie’s - you know, that gorgeous rich matte look. This is a beautiful colour and it looks very nice on but it doesn’t 100% dry out so, even though it’s not shiny, it doesn’t look very matte either. Nevertheless, I love it and it’s my go-to lip product when I want a bold lip!